Diodes, also known as rectifiers, are a basic component of modern electronics. As we work to create smaller, more powerful and more energy-efficient electronic devices, reducing the size of diodes is a major objective. Recently, a research team from the University of Georgia developed the world’s smallest diode using a single DNA molecule. This diode is so small that it cannot be seen by conventional microscopes. A diode is an electrical device that allows current to move through it in one direction much more easily than the other. No diode prevents 100% of current flow in one direction while allowing unlimited current in the other direction—in reality, a diode will always allow some current in both the “forward” and “backward” directions. The larger the imbalance favoring the “forward” direction, however, the better diode we have. Diodes are responsible for controlling the current in many common electronic components. Millions of diodes are embedded in a single silicon chip, and to increase the processing power of these chips, the diodes need to be made smaller. Following a prediction originally made in 1965 by Intel co-founder Gordon Moore, now known as Moore’s law, scientists and engineers have been able to make smaller and smaller computer hardware by doubling the number of electronic components in a silicon chip every 18 months. These improvements in computing power are approaching the physical limits of silicon, however; when silicon components are too small, they will become unstable and their performance unpredictable. 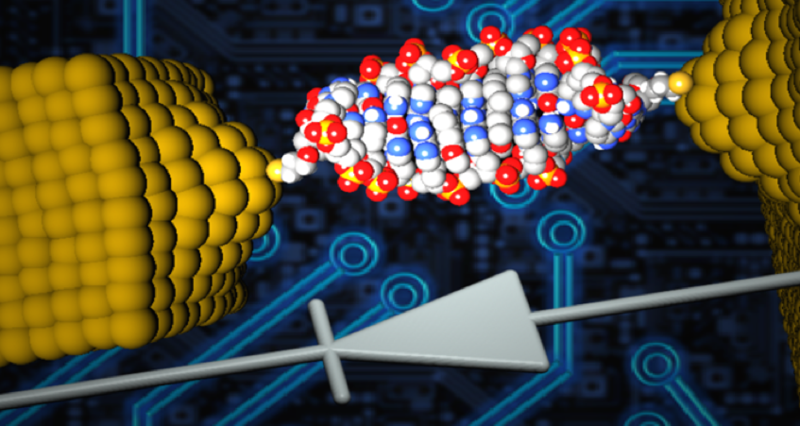 Since the 1970s, single molecules have been proposed as the ultimate means to downscale electronic components and to overcome the limit of Moore’s prediction. This is because molecules themselves are the smallest stable structures. The use of molecular circuits could raise device density a million-fold compared to current solid state devices. We believe DNA is an excellent candidate for use in molecular circuits, because it has a diverse but predictable structure and is also highly programmable. First, however, we must show that DNA can control the flow of electric current as needed to function as a diode. DNA is a double-stranded polymer consisting of chains of base pairs. The four DNA bases generally pair in a predictable way, adenine (A) with thymine (T) and cytosine (C) with guanine (G). The sequence of base pairs is what makes a particular DNA molecule unique. The University of Georgia research group began by constructing a single DNA molecule from 11 base pairs. The sequence of the first strand was CGCGAAACGCG, with complementary strand GCGCAAAGCGC and three mismatched A–A base pairs at the center. Notice that the complementary strand is identical to the first strand, but in the reverse order, creating a symmetrical DNA molecule. We then connected this DNA molecule to an electronic circuit only a few nanometers in size. When we measured the current through the molecule, it did not show any special behavior. When two small crescent-shaped molecules called coralyne were inserted, or intercalated, between the three A-A mismatched base pairs, however, the behavior of the circuit changed dramatically. The current was 15 times larger when negative voltages were applied than when positive voltages were applied, showing the asymmetrical conduction of current necessary for a nanodiode (Fig. 3). At first, this result was counterintuitive, since the molecular structure of the DNA molecule still appears symmetrical after the addition of two coralyne molecules. 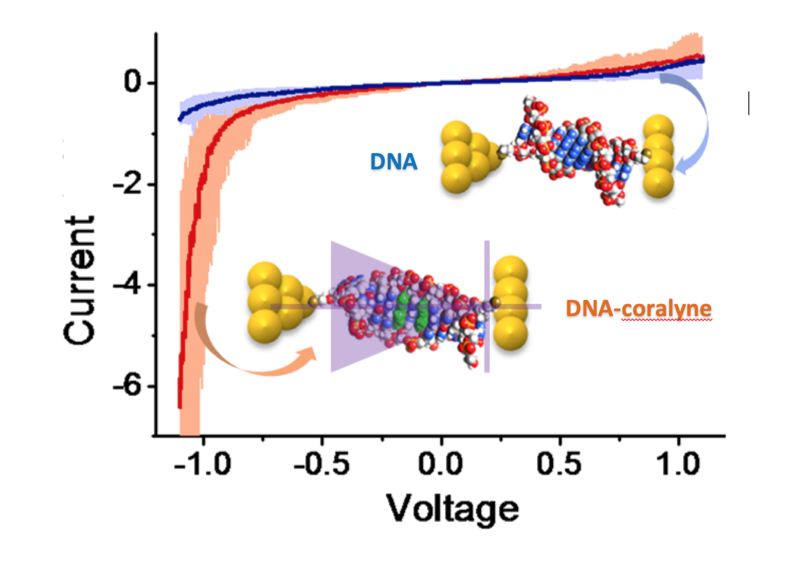 Our collaborators at Israeli Negev Ben-Gurion University constructed a theoretical model which identified the source of the diode-like feature—when a voltage is applied to the DNA molecule with coralyne, a breaking of its spatial symmetry occurs, so it readily conducts current in one direction but not the other. We have constructed a molecular rectifier by intercalating specific, small molecules into designed DNA strands. While this discovery is very promising, there is still a long way to go before DNA will replace today’s silicon-based devices. The research team plans to continue its work, aiming to construct additional molecular devices and to enhance the performance of the molecular diode. Fig. 2 (Click to enlarge) Fig. 2 The DNA molecule containing three mismatched A–A base pairs at the center, without (top) and with (bottom) intercalated coralyne molecules. Fig. 3 (Click to enlarge) Fig. 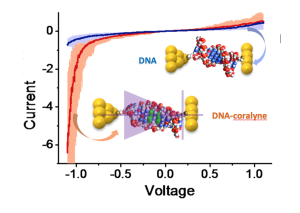 3 While the current through the original DNA molecule stays essentially the same regardless of the voltage applied (blue line), the current through the DNA molecule with intercalated coralyne changes dramatically with negative or positive voltage (red line). This is a necessary feature of a nanodiode.